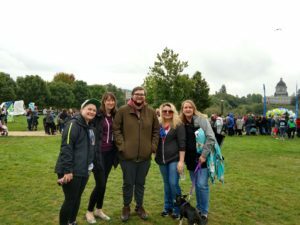 In observance of National Suicide Prevention Month, GoodTherapy team members participated in the American Foundation for Suicide Prevention’s (AFSP) 2018 Out of the Darkness Community Walk for the fifth year in a row on Saturday, September 15. The walk takes place annually at Heritage Park in Olympia, WA, and follows a 1.5 mile path around Capitol Lake. This year, it involved 730 participants and raised over $50,000 in funds toward suicide prevention programs and support for loved ones of people who have died by suicide. The GoodTherapy team met our fundraising goal of $500. If you would like to donate to AFSP through GoodTherapy, it is not too late! Fundraising will be open until the end of this year, so if you would like to donate, visit our Out of the Darkness team page to do so. Out of the Darkness Community Walks take place each year in hundreds of cities around the United States. In Washington state, suicide is the second leading cause of death for 15-34 year olds and the eighth leading cause of death overall, and the state suicide rate is slightly higher than the national average. These facts may have contributed to a sense of urgency for many who participated in the annual walk for many Olympia and Washington state residents. In the U.S., as many as 123 people die by suicide every day, and the suicide rate has increased from 11.6 per 100,000 people in 2008 to 13.4 people in 2016. Since 1987, the AFSP has been working toward the goal of reducing the suicide rate by 20% by 2025. Their mission is to increase awareness of suicide and suicide prevention as well as to fund scientific research on suicide prevention and make sure resources are allocated to those who need them most. GoodTherapy seeks to educate the public about mental health treatment, recovery, and therapy and reduce stigma for those who seek help. In the ongoing fight against suicide, our team also works to support therapists who can help people grapple with mental health issues, suicidal thoughts, or losing a loved one. Learn more about why language matters when talking about suicide or how to continue raising awareness about suicide prevention year-round. It’s crucial for those who are contemplating suicide to seek our help immediately. Many helpful resources exist for people who with hopeless or suicidal thoughts. If you or someone you know needs help right away, call the National Suicide Prevention Lifeline at 1-800-273-8255 (TTY: 1-800-799-4TTY), see our crisis page for additional resources, or find a licensed and compassionate therapist here. Thanks for sharing with us this month!